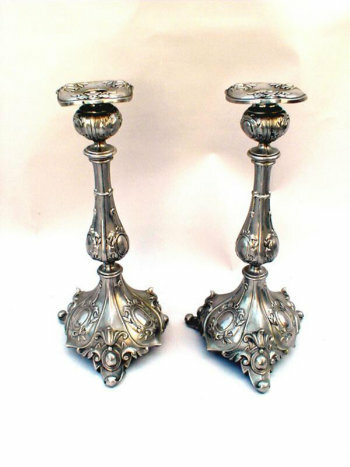 Rare and Magnificent German silver plated Sabbath candlesticks. Tripod scrolled and acanthus leaf feet sit atop a domed and embossed base. Baluster stem and base detailed with cordon pendant cartouches entwined in laurel wreaths. Fit with beautiful matching laurel leaf bobeche in embossed relief.